I read widely and voraciously, with little discipline (although I have my bouts). And then I write about it -- sometimes a little, sometimes more (not sure how often I get to "a lot", so let's go with "more" instead). I'm a Mystery junkie and have been since I can remember, I love Urban Fantasy, I can't pass up good Science Fiction or Fantasy, I've been known to dabble in Chick Lit ('tho, honestly, I'm more comfortable in "Lad Lit"), even a decent Western will do the trick. Atkins' take on the Dukes of Hazzard(??) is another stellar installment in the Quinn Colson series. They sat there in silence for a bit, enjoying the warm breeze, the empty, quite sounds of the hot wind through the trees. He and Boom could be together for a long while without saying a damn word, same as it had been hunting and fishing when they were kids. They didn’t feel the need to fill that silence with: bunch of empty-headed talk. “This place is a lot different from when you got back," Boom said. “People in town said for me to burn the house down," Quinn said. “And a suede coat and a bottle of Fine bourbon from Johnny Stagg." Boom nodded, silent again for a while. Quinn drank his beer watching Hondo, now just a flitting dark speck among the cows as he worked them a little, letting them know who was in charge. Nearly ten years Quinn’d been back and he wasn’t sure he’d made a damn bit of difference. On the one hand, it's easy to argue that with Quinn -- even just one of the seven preceding novels would tell you that. But, it's easy to see where he'd get to thinking that way -- Tibbehah County is a very much poster child for The More Things Change, The More They Stay The Same Club. The Sinners is full of nice little moments like this -- quiet, reflective moments with Quinn and Boom, Quinn and Lilly, Quinn and Maggie. While it'd be easy (and understandable) to focus on the storylines featuring the Pritchards or Boom Kimbrough -- the heart of this novel is in these moments. You want to know what Quinn Colson, or this series is about? Focus on these conversations, the quiet in the midst of the storms. But that doesn't mean we should ignore the storms. The first story (not in the book, but here) focuses on Boom Kimbrough, Quinn's oldest friend. Unwelcome at his old job keeping the Sheriff Department's vehicles running (among other things), thanks to the county supervisor we met in last year's The Fallen, Boom's moved on to doing some interstate trucking. Convinced (wrongly?) that a black man with one arm isn't going to be hired by anyone else, he's stuck with one particular company. And once he becomes suspicious about the cargo he's sometimes carrying, he's ready to quit -- but despondent and frustrated about what he'll do as an alternative. His boss doesn't want him to leave -- and uses a couple of tough looking employees to convey that to Boom (Boom's not the only one they'll threaten -- Fannie Hathcock is also a target). Clearly, they don't know enough about Boom, and before you know it, Quinn is informed about it all. Which brings in FBI agent, Nat Wilkins (more about her in a second). Things get hairy from there. This is the secondary story -- and gets that kind of space -- but it's really the more interesting of the two major plots, mostly because it's what forces Fannie and the Dixie Mafia toughs to get involved in the other story. The major plotline involves the anti-Bo and Luke Duke. Tyler and Cody Pritchard are a couple of good ol' boys concerned with racing their stock car, women, and growing/selling the best weed in The South. Things are going fine for them, by and large: they race, they grow and sell, which funds the racing, enabling them to attract women. Sure, they've double-crossed Fannie a bit, but that's really nothing major. Until their Uncle Heath gets out of prison after doing 25 for his part in laying the groundwork of their marijuana growing. Heath, too, is an anti-Duke. He got caught, for one, and he's not in the habit of keeping his nephews out of trouble, in fact, he makes things worse for them and spurs them into bigger and worse crimes than they'd been accustomed to. Now, long time readers will have done the math here -- Heath did 25 years, Quinn's been around for almost 10, having taken over for . . . that's right, his Uncle, Hamp Beckett. Hamp and Heath apparently were quite the cat and mouse for a while (Hamp perhaps being spurred on by his "Boss Hogg," Johnny Stagg -- I swear I'm done with the Dukes now) until he finally got the goods on Heath and sent him away. That story kicks off this book and is a great way to open. To say that Heath has got a chip on his shoulder toward Hamp and his nephew would be understating things a wee bit. So we've got Heath dragging his nephews into bigger and badder felonies, making them targets for the Dixie Mafia, who are having troubles with things at Fannie's, and one of their transportation venues is being scrutinized thanks to Boom. Oh, yeah, and Quinn and Maggie are a couple of weeks away from tying the knot and Quinn's mother is becoming a pest about the ceremony and reception. It's set to be a good time in Tibbehah. This is told with Atkins' typical skill, eye for detail, good timing and atmosphere. It's hard to find something new to comment on. One thing I really appreciated was how clever he had Quinn act when it came to putting the pieces together. We're all accustomed (especially in film or television) for the police to be close to figuring things out, but needing a vital piece of information from an unconscious, unavailable, or non-communicative witness until the last second. By the time the unconscious witness woke up and started providing the clues and identities needed to put anyone away for their crimes, Quinn had already sussed it out and was in the middle of making the necessary moves. One more Hazzard reference, I lied, get over it -- Quinn is very much the anti-Sheriff Rosco P. Coltrane. I spent so much time feeling bad for Tyler and Cody -- they aren't characters I'd typically like. There's little to commend them -- they're not that bright, not that talented, not that nice, I can't imagine why any woman would want to spend time with them (not that we have proof that any do), and seem destined to lead quiet little lives of no consequence. But once their uncle forces them into things, I just wanted them to find a way back to their petty little pot farm. I spent more than a little time worried for Fannie, too. She's as despicable as they come, too, but as characters go, I like having her around. The way she's treated by her superiors shows how tentative her situation is -- and Quinn could be facing someone worse than her or Stagg pretty soon. Speaking of worries -- I spent most of the novel very concerned about the heath, well-being and longevity of a character that's been around since The Ranger. I don't think for a second that Atkins feels the need to keep any one of these characters alive. Frankly, it's be easy to make the Quinn Colson novels the Tibbehah County Chronicles or the Lilly Virgil novels -- no one is safe, including Quinn. Making it very easy for me to spend a lot of time worried about someone I like. Obviously, I won't tell you how right I was on that front -- but I wasn't wrong. Naturally, Atkins gets the characters right. You know from the beginning how worthless Heath Pritchard is, how nasty the Dixie Mafia toughs are, how lame the Pritchard boys would be without prodding (lame, but amusing). We meet new federal officer here -- Agent Nat Wilkins. I'm glad that Quinn isn't wholly dependent on the DEA Agent (whose name escapes me for the moment) for outside support anymore. But more than that, I'm glad that Wilkins is who we get to see in this role. She's brash, she's smart, she's fun -- she really isn't like any Law Enforcement type we've met in this series to date. I'm sure we'll see her again, hopefully soon. I'm not saying I need to see her next year, but if I don't see her again by 2020, Atkins can expect me to lead an online riot. It was good to spend time back in this troubled county, checking in with our old friends and some new ones (I'm really liking Maggie, and hope she sticks around). As much as I enjoyed Atkins', Old Black Magic, I think this is his better work this year. 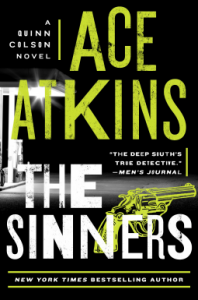 As satisfied as I was with the story, I'm already impatiently waiting for the next installment -- between how much I liked The Sinners and the way that Fannie's last line promised to make the next book a doozy, it can't come soon enough.